Pregnancy can be a daunting time. Everything from your budget, household, diet, and even skincare needs to be carefully looked at. I love finding pregnancy-friendly skincare brands so all the hard work is done for me! Basq NYC Skincare is an entire line of skincare geared toward pregnancy to encourage smooth, hydrated and refreshed skin. I have a few favorite products that I've been using every day. Intensive Treatment Stretch Mark Butter | This butter helps prevent and repair existing stretch marks and can be used every single day. I love the lavender scent, it's so calming! Key ingredients in this rich butter include biopeptides for elasticity, darutoside for collagen renewal, and algisium-c for healing and smoothing. It only takes a tiny bit of this butter to coat the skin and it feels incredibly rich and silky. It also absorbs well so I don't have any residue on my skin when I go to get dressed. I use it on my belly and sides to prevent itching throughout the day. I can't wait to see what this does for my existing stretch marks! 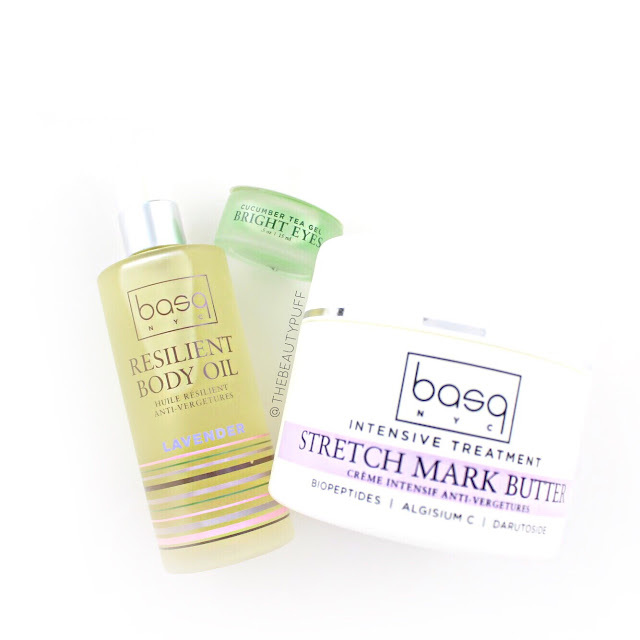 Resilient Body Stretch Mark Oil | Another way to combat stretch marks while hydrating skin is with the Basq Stretch Mark Oil. This oil comes in eucolyptus, citrus, and lavender which I have. There's something about a body oil that I find extremely comforting and nourishing. This formula has a combination of hazelnut, sunflower and sweet almond oil to deeply hydrate skin. The bottle has a pump for easy dispensing and I typically use 4-5 pumps at a time after my shower. Again, as with the butter, this formula absorbs really well into the skin leaving no greasy feeling. Bright Eyes Cucumber Tea Gel | That pregnancy glow doesn't come naturally when you already have a toddler running around! This eye gel is a lifesaver for particularly tired days when my eyes need extra refreshing - ok so basically every day! Its cooling formula is really soothing on the skin so I enjoy putting it on every morning. This gel has antioxidants and green tea to reduce puffiness and smooth fine lines. It can be used in the morning prior to makeup application and also at night for a more intensive treatment. The tiniest tap into the gel takes care of both eyes so this jar will definitely last me through my pregnancy! Basq NYC Skincare products are free of mineral oils, parabens, phthalates, sulfates, and artificial colors. Looking for a great selection of pregnancy-safe skincare for yourself or a pampering gift? Explore the entire Basq NYC Skincare line below!